Thank you for volunteering with Girls Rock Charlotte!! We know that you appreciate why every member of volunteer must complete an annual background check (good through December of each year). We always ensure the ongoing safety of the youth we serve. We use an accredited National Association of Professional Background Screeners and secure online resource for background checks...Goodhire.com! In order to protect your personal information and identity, we ask all of our volunteers to control this process. You purchase (for $19.99) a "Starter Check" of your background. You will see and own the results/report. 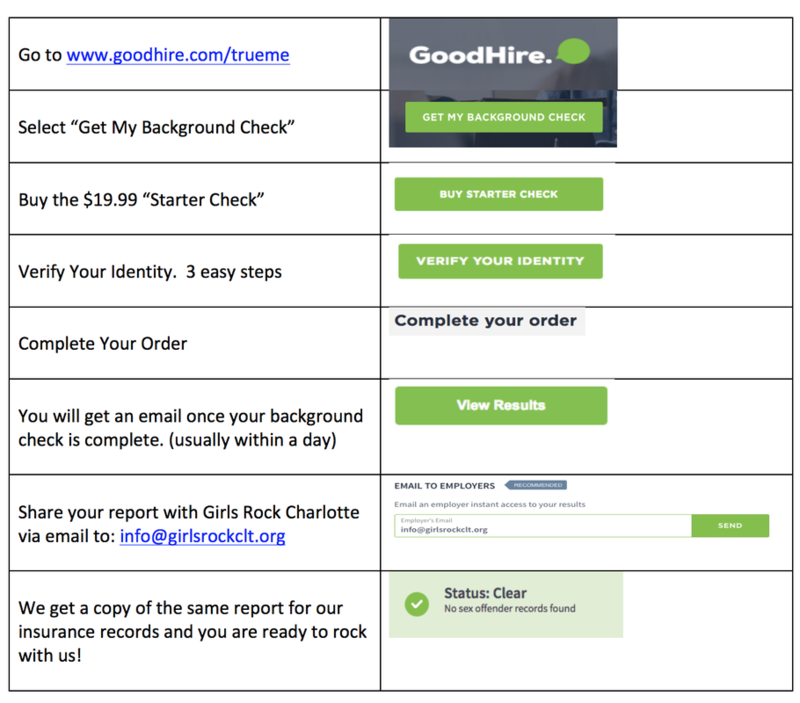 Then, Goodhire.com allows you to share your background check with certified organizations...like us! ​Here's how it works in 7 easy steps! See image below for instructions. When you're ready...go to Goodhire.com! You rock!! !